An analysis of taxable retail sales figures for the first half of 2011 shows a positive trend for a majority of the markets studied in Louisiana. 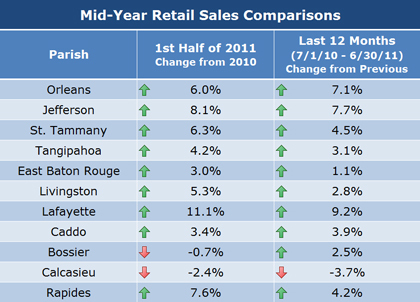 Comparing the first 6 months of 2011 to the first half of 2010, Lafayette Parish showed the biggest increase in retail sales at 11.1%, followed by an 8.1% increase in Jefferson Parish. Rapides, St. Tammany, Orleans, Livingston, Tangipahoa, Caddo, and East Baton Rouge Parishes also showed positive gains ranging from 3.0% to 7.6%. The 2 parishes showing decreases in sales, Bossier and Calcasieu, only saw slight decreases of 0.7% and 2.4% respectively. The Mid-Year Retail Sales Comparison table below also shows a comparison of the last 12 months (July 1, 2010 to June 30, 2011) to the previous 12 months (July 1, 2009 to June 30, 2010).